Debut author Shazaf Fatima Haider’s humorous novel on arranged marriage – titled How It Happened – had its official Pakistan launch today in Karachi. The event, which was organised by the Lyterati Society at the Lyceum School just off Do Talwar, was a impressive affair as book launches go, with about 300 hundred people in attendance. The launch attracted some big names from the industry, including Pakistan’s most beloved television playwright, Haseena Moin, DSC prize-winning author H.M. Naqvi, and Afzal Ahmed Syed, who is one of the foremost contemporary poets writing in Urdu today. The event was moderated by our favourite Pakistani author and friend of DWL, the recently Man Asian Prize shortlisted Musharraf Ali Farooqi. Farooqi added a good dose of humour to the conversation, entirely fitting with the mood of the book. Farooqi and Haider touched upon topics as diverse as crazy rishta stories to the impact of the author’s own ancestral history on the book’s characters. 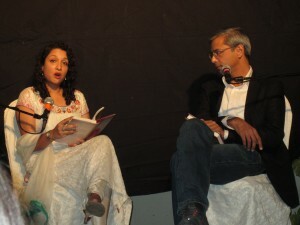 Since the novel is a family drama, the moderator asked Haider at one point whether her family saw itself in the book. She quipped that each of her sisters believed themselves to be the character of Zeba, who was supposed to be very beautiful. The launch included a reading by the author and a brief but lovely tribute by Haseena Moin, who praised Shazaf Fatima for having written a novel that acknowledges how times change and forges a path forward for women from her generation. Haider’s book is slated to be a hit in a market starved for readable, feel-good fiction and is sure to strike a chord with South Asian women who’ve suffered the classic rishta-trolley parade ad nauseum. Indeed, Liberty Books had set up a table stacked with copies of the novel at the launch, all of which were sold out even before attendees were done with their tea and samosas. Desi Writers Lounge is proud to be partnering with Shazaf Fatima Haider in a blog contest to celebrate the 200th anniversary of Pride and Prejudice, Jane Austen’s classic novel on marriages in Regency-era England. The winner will receive a hardcover copy of How It Happened. Details on the contest can be found here. January 2013 is the 200th anniversary of one of English literature’s greatest social satires: ‘Pride and Prejudice’ by Jane Austen. To mark the occasion, Desi Writers Lounge is running a blog contest. What’s the funniest true story you’ve got about people getting married? It could be your own story or someone else’s. Botched proposals, unreal rishtas, failed elopements, family feuds, last minute changes of heart – we want to hear it all. Wit and style will be rewarded. Send your entries of 500 words or less to editor.papercuts@desiwriterslounge.net. The best entries will get published on the DWL blog (that’s what you’re reading right now) and the winning entry will also receive a copy of the funniest new book in town about arranged marriage: How It Happened by Shazaf Fatima Haider (Penguin India). Deadline: 29th January. Time to get funny, peeps. These are ruthless times. (Want more proof? Here.) And being a publication that keeps up with the times, we’ve come up with this theme for our next issue: Dog Eat Dog. Papercuts magazine is soliciting poems, stories and essays about success that comes at any cost: about cutthroat competition, about ambition that knows no bounds. You can write about politics, religion, status or plain old gossip – we don’t care. Just show us how things get ugly. Questions? See the submission guidelines. Deadline: 15th May. In case you haven’t gotten it yet, here’s another video of people punching people. Happy writing!